Since we are camped in a spot with the Interstate on one side of us and railroad tracks on the other, we were concerned about how well we would sleep due to the noise...but it ended up being a fairly quiet night and we had a great sleep. It makes a big difference when the trains don't blow their horns...and I didn’t even notice the freeway noise. Steve said he could hear it but it wasn’t bad. After a nice leisurely start to the day, we decided that we must do our resistance exercises today...we have been neglecting them over the past week due to our daily travelling. But since we had absolutely no plans for today, we really have no excuse. After 6 days of travelling (well, at least packing and unpacking the fifth wheel), we are ready for a “down” day. After showers, breakfast and dishes, I continued working on our blog. I will have it totally up to date today. The only other thing that we must do today is research our next stop. We will likely travel to the Olympia area tomorrow and spend a couple of nights and then go onto Burlington on Friday. Steve called Camping World to make an appointment so they can take a look at the wiring work they had done when we first started our adventures. Apparently, a couple of different RV places have commented that the gauge of wire used from the Inverter to the breaker box is too low....interesting...better get them to check into it. Late morning we thought that we would go outside for a walk. Considering it is supposed to be a cloudy rainy day, it is pretty nice out...well, that wind is darned cold but the sun is shining and it’s not raining out. Unfortunately, the forecast for the rest of the week...and the rest of our trip to BC...is nothing but rain, rain, rain...sheesh! I made cookies this afternoon and after posting the blog, we researched campgrounds on our route north. I think that Millersylvania State Park just outside of Olympia will fit the bill...it’s about a 3 hours drive plus rest stops, leaving another 3 hours or so to Burlington. No need to rush...our appointment at Camping World is at 1 p.m.
We parted ways with Dennis and Suzanne (and Dunkin) this morning...they are heading north to Omak, Washington and then into BC with Oliver their destination. We will be continuing west on Interstate 84 towards Portland. After big hugs, they climbed into their coach and pulled out...it was about 9:30. We had so much fun with them and after 11 days we are really going to miss them...bye guys...safe travels! We arrived at Memaloose State Park, about 12 miles west of The Dalles, Oregon, at 1:00...a fairly short 3 hour drive (including a couple of breaks). The setting of the Park on the Columbia River is very nice and at $20/night for full hook-ups, it is very reasonable and a good stop-over spot. We quickly chose site B31, a back-in site where our back window overlooks the river. We decided to stay 2 nights...a "down" day tomorrow sounds like a pretty good idea! Now...the down-side to the Park is that it is right beside I-84 (the freeway is just above us) and there are railroad tracks immediately below us (along side the river). If that weren't enough...there are also railroad tracks on the other side of the river. Oh well, as I said...it is a good stop-over spot on our way back to BC (we can take our time because we don't have to be back until Saturday). We had a nice relaxing evening watching TV in front of the fireplace...it is definitely colder than what we are used to...we miss Arizona!! We were up at 6:00 again this morning...I enjoy having my coffee time before we have to get going. I was having a shower while Steve was sitting at the table having breakfast when Suzanne came out of their coach with their toaster...and proceeded to throw it up in the air! Yesterday while we were shopping she was looking for bread because she really craved toast and peanut butter for breakfast. Well, I guess the toaster stopped working right in the middle of making her toast...obviously that didn`t make her very happy!! When I came out of the shower, Steve told me to look outside...a toaster was sitting in the grass...too funny! A couple of minutes later, Dennis was out sheepishly gathering the toaster. Well, I guess what he had discovered was that the toaster and the space heater were on the same circuit and had blown a fuse...the toaster still works after all! Okay, that was a good way of emptying out all the crumbs out of the toaster! I would have loved to have gotten a picture of her throwing the toaster! It was 9:15 when we pulled out of Mountain Home RV Park...a very nice park (one of the nicest private parks we have stayed at) with very nice people running it! We will definitely stop here again should our route south or north bring us to this area...a great stop-over spot. We walked up to the casino where we had dinner...very good...but of course, we ate too much! Afterwards we hit the slots...we`ll meet back in front of the restaurant in an hour. Suzanne and I were the first to arrive at our meeting place...followed by Steve (who was up $25...me...I was down $10)...but where the heck is Dennis? He must be winning! Eventually, I went to hunt him down...and sure enough, he was on a lucky machine. Steve and I decided that we had had enough of the smoke filled casino...it was terrible! Through all the casinos we had been in while we were in Laughlin and Las Vegas, we had occassionally noticed a bit of smoke but on the whole, the ventilation systems were great. Not so here...yuck! And of course, it was Saturday night...and very busy! We left Suzanne with Dennis and headed home...fresh air...ahhhh! Tonight was our last night with Suzanne and Dennis...we are parting ways tomorrow as they head north and we continue west towards the Portland area. We don`t need to go into Portland now because we have our new tires, so we will likely bi-pass and head north on the I-5. We all decided to stay another night here...Steve and I were taking the trailer in for new tires and besides the weather forecast for tomorrow was better. We had been watching the forecast for the mountain passes we have to go through on our route...there is one particular one called Cabbage Hill that can be tricky—we don’t want any snow or ice. Even if we weren’t traveling today, I still had to pack up the inside because we were taking the trailer to Les Schwab Tire Center. Steve unhooked everything outside and just left everything in place for our return. It was 8:45 when we left our site and headed to the tire place...just a couple of miles away in downtown Mountain Home. To our relief, Les Schwab had a huge lot with plenty of room for Steve to manoeuvre the rig and park. A fellow from the tire store came out and met with Steve and after taking a look at the tires, they went inside the store. A little while later, Steve was back and he moved the rig into the “big rig” area for the installation of the new tires. Apparently, the heavier duty G rated tire Steve wanted wouldn`t fit due to limited space in the wheel wells...just not enough room for the higher profile tires. So he got the best tires he could that would fit that were E rated....the same as the old tires just a different brand. They assured Steve that the Power King TowMax was a good tire. It just so happened that this was the same tire as our spare...a brand that Steve had never heard of before and assumed that it was a poorer quality tire than the original Goodyear Marathon. Steve figures that we have put approximately 38,000 km/23,750 miles on the trailer plus whatever was on it from the factory to Victoria. We started to notice poor wear on some of the tires last year when we did a tire rotation in Georgia. A fellow Montana owner told us he got only 800 miles on one of his tires when he noticed a bulge...so I guess we got awesome mileage on ours!! As we were waiting for the work to start, Steve noticed just how bad one of the tires was...the rubber was completely worn with the steel cords exposed. Either this just happened on our last trip or every time Steve checked the tires we were parked on that part of the tire. The tire guys couldn`t believe how bad all the tires were from tread separation...we were very lucky that we hadn`t had a blow­-out. Because we are on the move and don`t have the room to haul 4 tires around the manager said he would make the warranty claim for us, so hopefully we get a decent credit towards our purchase. Once all the new tires were installed, Steve went into pay and just double-checked to ensure the tires had been balanced. Well, I guess it is a good thing he asked because the installer had missed that very important detail on the work order....they don`t normally balance trailer tires and our originals weren’t either. Consequently, they had to remove each tire and balance it. About 2 hours later we pulled back into our site at the RV Park....very relieved that we had new tires. Thank goodness we had had that discussion with that fellow Montana owner yesterday afternoon. We got all set up (again) and while we had lunch, Dennis and Suzanne took Dunkin to a vet to get his nails cut and to pick up some special medication he needs for his skin. When they got back, Suzanne and I went over to Walmart, a short distance down the road, and did a little shopping. As usual, we both went to just pick up a couple of things...and returned with bags and bags! While we were gone, Dennis helped Steve with the wiring to get the cable working. The park has free cable and since we weren’t staying long, Steve hadn`t bothered putting up the satellite. But when the new receiver was installed, they had changed some of the wires...anyway, they managed to get it sorted out and the cable was now working. Let`s hope the satellite still works next time we set it up! The rest of the afternoon and evening was pretty relaxing. Suzanne and Dennis came over for happy hour...we sat inside today because it was just too chilly out...what a change from yesterday when we sat outside in our shorts! After dinner, we watched TV...but it wasn`t long before I was falling asleep and headed to bed. I guess Steve ended up watching about 4 episodes of America`s Most Wanted and turned the TV off at midnight. Well...as you can tell, I am way behind on our travel blog so I thought I would just combine these days into one posting. Monday was our last day at Sam’s Town and it was spent primarily getting ready to leave in the morning....basically a work day for everyone. Steve and I went out to run a couple of errands and fill up with diesel. That took way longer than expected so I was late getting the ribs into the oven...we’re having Suzanne and Dennis over...but they turned out great just the same. We spent a lovely last night in Las Vegas...great dinner...great entertainment (Eagles Farewell Tour DVD)...and great company! This semi had a bit of a mishap...I wonder what happened...perhaps he fell asleep? 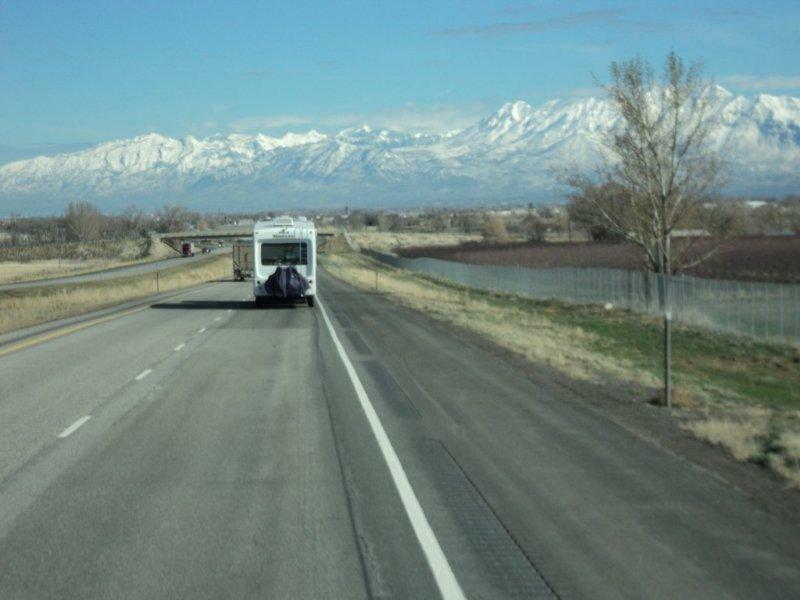 We were up Wednesday morning and on the road again around 9:00...our destination today is Brigham City, Utah, just north of Salt Lake City. We have booked into the same RV park that we stayed at on our way south last October. We were on the road early again on Thursday. We started off with lots of blue sky but there were some dark looking clouds in the distance...but we managed to skirt around them. The scenery wasn't quite as spectacular as it had been the last couple of days...but it was still another great day for travelling. 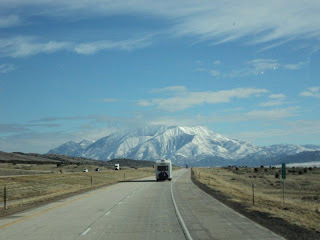 It was around 2:00 when we pulled into Mountain Home RV Park...in Mountain Home, Idaho. The sun was shining...it was warm...we quickly changed into our shorts. After getting all set up, we sat outside for a bit...and then Steve and I decided we would go for a walk around the park before happy hour. It turned out to be a very good idea, because we stopped and talked to a couple (that ended up working/hosting at the park) that also had a Montana fifth wheel. Steve asked about the tires...that is when we learned that the tires wear oddly...and are basically "cheap garbage". They had had 3 tires blow in less than 5000 miles with lots of damage to the skirting. We found out that it is not an alignment issue...instead it is a problem with the tires. The Montanas have Goodyear Marathon tires that have a tread separation problem. After our conversation, we continued our walk and decided that we had better check into a tire store here in Mountain Home. Looks like we are all going to stay another night here while we get new tires tomorrow.